This is one of my all time favorite dessert recipes. Moist, delicious, and the flavors are a bit unique. 1. Preheat oven to 375° F. Grease 10-cup bundt or round tube pan. 2. Microwave 1 1/3 cups morsels in medium, microwave-safe bowl on medium-high (70%) power for 1 minute; stir. Microwave at additional 10- to 20-second intervals, stirring until smooth. 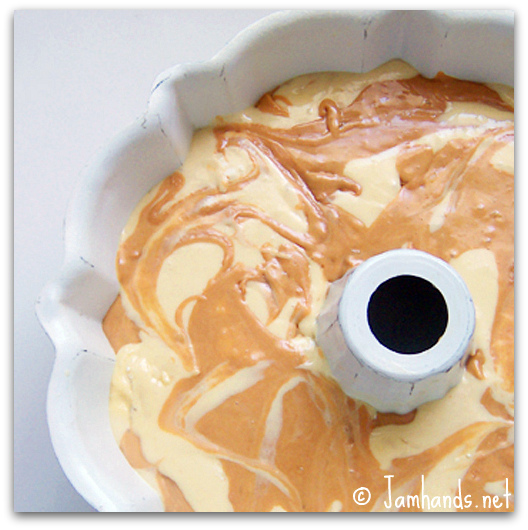 Combine cake mix, eggs, bananas, vegetable oil, water and granulated sugar in large mixer bowl. Beat on low speed until moistened. Beat on high speed for 2 minutes. Stir 2 cups batter into melted morsels. Alternately spoon batters into prepared bundt or round tube pan. 3. Bake for 35 to 45 minutes or until wooden pick inserted in cake comes out clean. Cool in pan for 20 minutes; invert onto wire rack to cool completely. 4. Place remaining morsels in small, heavy-duty plastic bag. Microwave on medium-high (70%) power for 30 seconds; knead. Microwave at additional 10- to 20-second intervals, kneading until smooth. Cut tiny corner from bag; squeeze to drizzle over cake. Oh, man, I looooooove me some butterscotch. Banana cake constitutes a fruit serving, right? Looks amazing! But did I read that right? 24 servings!?? HAH! Not in my house. Wha a beautiful cake! Looks delicious. Your cake looks WONDERFUL! I'd love to try it! 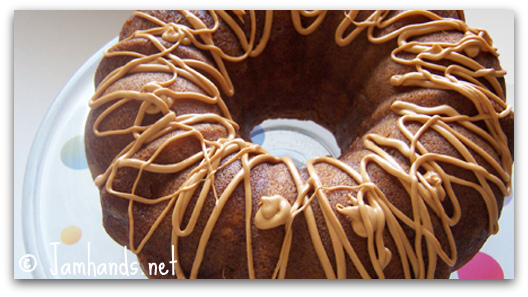 I have a butterscotch lover in the house, gotta try this one :) Having my first give away Monday, stop by and enter. Brilliant combo of such a delicious looking cake! I'm having a ball browsing through all your fabulous recipes!!! Goodness, I am in heaven with all these yummy treats! HEAVEN!!! This sounds amazing! Lately I've been making butterscotch banana pancakes for my kids. They are great because no need for syrup! Keeps my 2 yr old unsticky. Hello lovely recipe.... House can I substitute banana in this cake? ?